Since the first magnet made its way from the laboratory to an imaging facility, MR has gone through large and small developments that improve both scan quality and the patient experience. Much of what’s new in MRI involves not only improved visibility into the human body but greater accessibility and comfort. 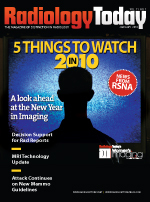 This article recaps MR vendors’ latest additions to their imaging products. FONAR, known for its Upright Multi-Position MRI, focuses its efforts on enhancements that meet the needs of a specific patient population. According to FONAR’s director of communications Dan Culver, a new specialty coil and software designed for Upright MRI scoliosis examinations will assist with imaging pediatric patients. FONAR’s RF receiver coils include cervical, spine and body, open head, knee, wrist planar, and shoulder versions designed to handle the unique aspects of each part of the body. This is important, Culver notes, in light of symptom-specific changes in the MRI images, particularly with such clinical syndromes as Chiari malformations, pelvic floor dysfunction, and severe kyphosis in which patients cannot lie down. Because the Upright MRI places patients in the position that generates the symptoms, Culver notes that scans are more likely to show causes of the pain or disease—particularly in spinal examinations. Pelvic floor studies with the Upright MRI can also be more revealing than with traditional MRI, he says, showing clear changes in the area that can lead to better diagnosis of the cause of pelvic floor dysfunction. That same cause may not appear when the patient is lying down. GE Healthcare received FDA clearance in August 2009 for a device called MR-Touch, a visual palpation technology that, combined with MRI, replaces traditional physical palpation to determine tissue stiffness. This new technique, referred to as MR elastography, uses low-frequency sound waves in combination with MRI to measure tissue elasticity. According to Jim Davis, general manager of global MR at GE Healthcare, MR-Touch provides clinicians with a highly precise, noninvasive alternative for detecting changes in areas such as liver tissue where stiffness can be a sign of disease. The device can also assist in determining the status of tissue elasticity in areas of the body that are difficult to reach manually, according to Davis. MR-Touch is based on technology created at the Mayo Clinic in Rochester, Minn., and licensed to GE Healthcare. The device will be commercially available with the Optima MR450w 1.5T system, with a software upgrade and hardware accessory. Other additions to GE Healthcare’s MRI line will come from the company’s acquisition of ONI Medical Systems’ MRI platform. With this, GE Healthcare is expanding its product line to include ONI’s MSK Extreme 1.0T and MSK Extreme 1.5T dedicated extremity scanners. Due to their open nature and small footprint, these extremity scanners can be used in conjunction with a whole-body scanner and can also provide functionality as independent scanners used in orthopedic or sports medicine practices. Hitachi Medical Systems has its eye on patient comfort, with two developments that take into consideration space, orientation, and image clarity. The Oasis 1.2T boreless imager and the Echelon 1.5T each provide comfortable scanning environments for anxious patients and bariatric patients while also improving the time it takes to obtain clear images. The Oasis is a vertical field boreless imager with open-sided access equipped with new technology that operates a 1.2T magnet while offering uniform image quality, despite the device’s open nature. Typically, an open magnet would mean more comfort for the patient but reduced image clarity. Open MRI could be used for basic head, neurologic, and spine scans but was limited in the quality it could provide for musculoskeletal and abdominal exams. With the new Oasis, a six-channel active shimming feature helps operators maintain fat suppression uniformity for a broad spectrum of patient sizes. A symmetrical magnetic field also avoids any directional imaging constraint. The combination of a fast gradient subsystem and sensitive radio-frequency coil technology with the Oasis’ magnet nets general image quality and spatial/temporal resolution that, according to Shawn Etheridge, director of MR marketing for Hitachi, is comparable to many 1.5T imagers. The Echelon, a predecessor of the Oasis, is designed with the same imaging electronics as the newer device but is equipped with 150T/m/second slew rate gradients, 16 or 8 radio-frequency channel configurations, and multicoil connectivity. The Echelon’s feet-first imaging for all studies benefits both workflow and image quality. Etheridge notes that recent software upgrades to both devices involving workflow and image quality enhancements include a multiaxis parallel imaging capability called RAPID 3-D that increases image quality and resolution for breast and body dynamic imaging. Also enhanced are the RADAR T1 and RADAR T2/T1 features for complete motion-compensated studies. RADAR compensates for patients’ voluntary or involuntary movements during the course of a study and, in many cases, allows for scanning without the suppression of swallowing or without patients holding their breath. Ultimately, this cuts down on the number of repeat scans and moves patients along in a manner that is both comfortable for them and efficient for the imaging department. Philips Healthcare gave the industry a glimpse of its Achieva 3.0T TX MRI system and its MultiTransmit technology in 2008 while the device was still in development. On the heels of successful beta installations throughout 2009, the company commercially released the device in October 2009. The company says 3T imaging presented challenges for certain procedures due to dielectric shading and local specific absorption rates that can fluctuate depending on the individual patient and the part of the body being imaged. These challenges can result in contrast variations throughout the image and inconsistencies among patients. Philips’ MultiTransmit technology addresses these issues by using multiple radio-frequency transmission sources that automatically adapt to each patient’s anatomy. The technology advances enable Philips to offer new applications such as its Elite Breast and Elite Prostate solutions. In addition to technology advancements, Philips is testing a new conversion program for customers with certain older Philips 1.5T systems. Malhotra explains that with this program, customers can upgrade to the latest 1.5T platformm without completely replacing their existing equipment. Philips can simply strip out coils and other parts and replace them with new parts while leaving the magnet in place. On the horizon for Philips is a process called Sonalleve MR-Guided HIFU, currently in the investigative stage, for the noninvasive treatment of uterine fibroids. The system that’s currently installed at 16 worldwide research sites involves volumetric heating with real-time feedback, with the goal of higher procedural efficiency and short procedure time. With Siemens’ new MAGNETOM Aera 1.5T and MAGNETOM Skyra 3T scanners, the company introduces the fourth generation of its Tim (total imaging matrix) technology with its new Dot (day-optimizing throughput) engine. These two new scanners are the first to incorporate both Tim and Dot technologies. Tim 4G offers a completely redesigned radio-frequency system and all-new coil architecture that includes up to 204 coil elements utilizing up to 128 channels, with 48 channels as the standard configuration. This provides users with enough channels to support imaging with ultra-high density coils. Also, without coil or patient repositioning, the Tim coils enable users to cover a patient’s complete anatomy by up to 205 cm. Tim coils allow users to select exams rather than coils and can be seamlessly integrated to support large anatomic coverage. For example, users can combine head, neck, body, and spine coil elements to create a complete neurovascular view. Dot assists in tailoring and configuring scans to specific patient conditions, proposing optimized exam strategies. It adapts to each patient’s breath-hold capacity and then matches the proper protocol to that capacity, helping achieve consistent exams. Dot also comes with real-time onboard guidance, providing instant help when needed. Both devices have a 70-cm open-bore design. In addition, the super-short magnets allow many studies to be completed with a patient’s head outside the bore while still supporting a full 50-cm field of view. Other MRI innovations from Siemens include the Tim Dockable Table for easy patient preparation outside the scanner room. The component comes with an integrated, removable Spine 32-channel coil that is completely Tim compatible and able to integrate with DirectConnect and SlideConnect coil ports. Patients with physical challenges can be prepared outside the scanner room and then wheeled in for the exam. The table holds up to 550 lbs, even when mobile, and includes handrails for patient safety. Neither scanner is commercially available nor have they undergone 510(k) review. Siemens expects to begin shipping in the second quarter of 2010. Toshiba’s Vantage Titan 3T open-bore MR focuses on patient comfort and the improved exam efficiency that comes with it. This scanner, which is pending 510(k) clearance, boasts a 71-cm opening that gives patients more room and reduces claustrophobia. In addition, the system includes Toshiba’s Pianissimo vacuum-sealed gradient technology that can reduce exam noise by up to 90%. Another feature shared by both devices at both powers is a system of integrated coils useful for patients requiring multiple exams. Because the head, neck, spine, and body coils are integrated into the table, patients do not need to be continually repositioned. The Titan 3T system also comes with Toshiba’s proprietary contrast-free MRA imaging techniques that allow users to perform difficult vascular exams of the hands, feet, renals, full-body runoffs, and even complicated pulmonary embolism studies without the need to inject gadolinium. Urich notes that Toshiba’s customers are looking for a 3T device that can be their “all-in-one machine,” transitioning from a role as a research tool to a go-to device for scanning orthopedic cases, as well as high-end neurological conditions. Aurora takes the technology of its dedicated breast MRI system on the road with a mobile solution that helps hospitals and imaging facilities provide MRI services on site without large financial and spatial commitments. The Aurora Mobile Solution maintains the same 3D resolution and 0.7-mm slice thickness as the AuroraEDGE but in a format that allows facilities with low MRI volumes to still provide their patients with this service on site rather than sending them elsewhere. Much like similar mobile units for mammography and other imaging services, the Aurora breast MRI unit can be parked on a pad outside a hospital or imaging center. Images taken from MRIs performed within the unit are then shared via a server that can be accessed by a thin client by up to five other facilities simultaneously. With the American Cancer Society’s March 2007 guidelines stating that women at high risk of breast cancer should undergo breast MRI along with their annual mammogram, Smith notes that the need for breast MRI is not diminishing. The mobile until, which has been road tested throughout New England, simply affords women more opportunities to have both imaging procedures done at the same location. On the horizon for Aurora is an application that involves combining PET and MRI to enhance breast cancer imaging capabilities. While this system has not yet been tested on humans, initial results from the prototype indicate that the system produces a fusion of detailed PET and MRI images that should allow for more accurate breast lesion classification. The system involves inserting the PET scanner into an Aurora device while simultaneously scanning the breast tissue with both modalities, with the goal of improving specificity and sensitivity. Aurora, the U.S. Department of Energy’s Brookhaven National Laboratory, and National Cheng Kung University in Taiwan recently signed a memorandum of understanding to further develop this combined device, with the goal of beginning clinical testing this year.